The frequency of headlines boasting large payouts to hunters who participate in predator killing contests is alarming. A recent article from Pennsylvania reports that nearly $50,000 in prize money was awarded to coyote hunters during the 2019 Mosquito Creek Coyote Hunt alone. According to the Mosquito Creek Sportsmen’s Association’s website, 4,812 hunters registered for this event. The casualties included 227 coyotes who were officially weighed in following three-days of violence. The coyotes were destroyed by a variety of means: “bait”, “dogs”, “call”, and “driving”. But what do these killing methods actually entail? · Baiting: “enticing, tempting or captivating a predatory species to a certain location with food”. · Dogs: as decoys; to track/chase a coyote until exhausted and killed by the hunter; or to pursue and maul the coyote to death (coursing). · Call: to exploit the animal’s natural instincts by luring them to their death via hand or electronic “call” devices that mimic the sounds of distressed prey animals and/or other stimulating sounds. 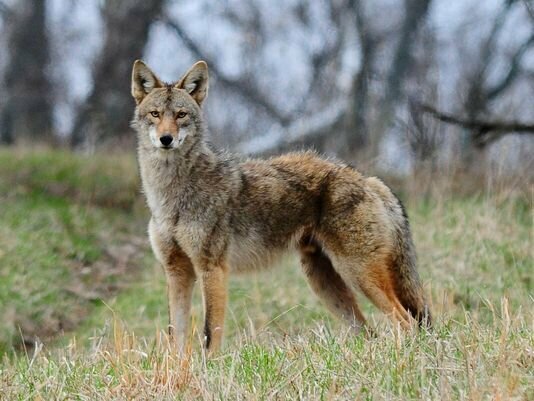 · Driving: teams of hunters work together by assigning someone to track/locate coyotes in a given area and chase them from their cover as the remaining hunter(s) lie in wait at the other end of the designated area until the coyotes are chased conveniently into their line of fire. Despite a level of unfairness, deception and entrapment that is anything but “sporting”, there appears to be no ethical concerns in the minds (and hearts) of the wildlife stewards and others who profit from the violence. And it appears most everyone profits from the suffering of these animals. The hunt’s posted rules require that all participants possess a valid hunting or fur-taker license. This licensing revenue flows into the wildlife agency’s coffers and is later matched proportionally by federal dollars. All hunt participants must maintain current membership status at Mosquito Creek Sportsmen’s Association thus generating a revenue stream via membership dues. Another financial benefit is derived from the administration fee that is included in the hunt registration fee – $2.00 per participant, or $9,620. Other beneficiaries, of course, are the contest winners themselves who profit handsomely. The government – at both the federal and state level – also gets a cut of the proceeds generated by the killing as the distributed awards are taxable income. According to the contest rules, IRS W-9 Forms will be issued in January 2020. Folks who are not entrenched in the culture of killing often question the integrity of those who participate in such brutality. Ironically, it seems the contest organizers do so as well. According to posted hunt “rules and regulations”, the “Association reserves the right to have an autopsy performed on any animal presented” if it believes the coyote was killed illegally or by unapproved means. All registered hunters must agree to undergo a polygraph test. Anyone who fails to cooperate will be disqualified. Failing a polygraph test results in disqualification from the current competition, all future hunts, and the revocation of club membership. The rules remind hunters that “the disposal” of all coyotes is their responsibility. A $50 fine will be assessed for any coyote left on the premises. Astonishingly, it seems the contest organizers anticipate their fellow hunters – presumably friends, colleagues, and family members – to be an unsavory group of folks who are likely to lie, cheat, and treat their victims like trash. Why wouldn’t everyone else view these people in a similar light, especially given the depravity sanctioned, glorified, and rewarded by these killing competitions?